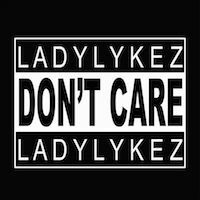 Feisty rapper Lady Lykez delivers a bouncy lyrical assault with her brand new single Don’t Care. Production comes courtesy of super duo Zdot & Krunchie, who were responsible for Stormzy’s ‘Know Me From’ and Lady Leshurr’s latest track ‘Lukatar’. On the the track Lady Lykez sets a few things straight following on from her controversial single Nobody Can, which she unleashed at the start of the year. Calling out a whole host of male MCs challenging them at their own game, the message behind the track was clear, Lady Lykez wants to be classed in the same category as the guys- and she was ready to take any of them on bar for bar! The fire from Don’t Care, proves Lady Lykez has no plans to slow down this year as she goes harder that ever, showing she is one of the best emcees in the UK.